It’s been a long six-month absence since I last wrote on this blog. Last week I returned to Tel Aviv just in time for a massive storm: almost hurricane-strength winds and lots of rain. Highways were flooded and closed causing massive traffic jams, snow has blanketed the north and Jerusalem, and schools are closed. For this I could have stayed in the Northeast where the sun is shining and it is warmer than here! In the meantime, much in this land has changed in the last six months but much has stayed the same. Palestine was recognized as a state by the United Nations, sort-of, and Israel’s right- wing government retaliated by approving 9,000 additional housing units over the green line and moving forward on the site planning for the E-1 area which juts out into the West Bank. The fulfillment of these actions will be the final nail in the coffin of a two-state solution. By completely cutting off Palestinian East Jerusalem from the rest of the West Bank, this new construction will remove the possibility of any part of Jerusalem being a Palestinian capital while the building in E-1 will permanently split the West Bank into two separate, non-contiguous cantonments. As elections in Israel approach on January 22, the right-wing parties have moved much farther to the right, purging moderates and advancing extremist elements, much as the Republican Party in the US has done. The difference is that, in the US, the Democratic Party remains strong and a force to reckon with. In Israel, the left is fragmented, weak, and under assault. The center and left parties have made halting and late moves towards a unified front. It probably is too little, too late. The irony is that polls continue to show a large majority of Israeli Jews, including significant numbers who vote for right-wing parties, strongly favor a two-state solution. But the right-wing narrative of fear and extreme nationalism, and the hesitation of too many leading left-wing leaders to challenge this narrative and offer a credible alternative, seems to be carrying the day for the far right. – 63 Palestinians were injured by Israeli forces during clashes and demonstrations, including nine children in the village of Tubas. The majority were injured with rubber-coated metal bullets (2 Israeli soldiers were also injured). – Israeli authorities demolished over 20 Palestinian structures in East Jerusalem and the West bank, making 15 people including children homeless. The demolitions were due to lack of building permits which Palestinians are unable to obtain even for needed structural repairs to their homes, farms or businesses. In addition, multiple vehicles were seized and fields were plowed under. They attacked and injured 3 Palestinians (One settler was injured by Palestinians in a rock throwing incident.). They vandalized or destroyed 230 olive trees (8,600 trees were destroyed or damaged in 2012). They burned one Palestinian home and four vehicles. They damaged 11 other vehicles by stoning or slashing tires. As usual, violent settlers were seldom prosecuted. It is like open hunting season. On a more positive note, several days ago I received a public letter from Rabbi Arik Ascherman of Rabbis for Human Rights (RHR) about a victory that they and their Palestinian partners won over the settlers. The letter offers a glimpse into the Wild West atmosphere in parts of the West bank and how, occasionally, justice triumphs – if only temporarily. I have pasted in the letter below. I didn’t know myself how moved I was going to be last Wednesday to see Palestinian tractors from Jalud plowing their lands with the protection of the Israeli security forces. It only happened when I stood there and realized that I had first been in this place in 2005. On that day I came with farmers from adjacent Kusara, who were apparently renting some of the lands directly underneath the “Aish Kodesh” outpost belonging to Fawzi Ibrahim from Jalud. Since that time, the settlers of Aish Kodesh have continuously expanded their “red lines,” beyond which Palestinians attempted to access their lands at their own peril. Thanks to Palestinian refusal to give up hope, and RHR’s amazing Occupied Territories legal team, old wrongs have been righted. That is something worth being emotional over. Aish Kodesh means “Holy fire.” The settlers here are certainly full of fire, but I think that it is “Aish Zarah,” a “Foreign Fire” that God neither commands nor desires (Leviticus 10:1-2). I have no doubt that these settlers truly believe that they are serving God. But, as someone who strongly dislikes stereotypes, and knows that not all settlers are the same, Aish Kodesh is one of the best places to find the stereotype of a religious, fanatic, and often violent settler. Just as in the Biblical story of Nadav and Avihu, the settler’s possibly genuine but tragic belief that they are doing God’s Will has destructive consequences. Back to 2005, I saw the farmers from Jalud peacefully plowing many of the same lands we plowed last week. However, the farmers of Kusara had apparently crossed the invisible “red line.” We had barely begun plowing, when settlers swarmed down the hill and attacked. The Israeli security forces were protecting us, but suddenly turned against us. Throwing stun grenades at our feet, they said we must leave, though promising that they would arrange another day for the Palestinian farmers to return. That day never happened. From year to year the “red lines” were expanded. A few years ago I was accompanying a senior army officer who was also threatened by a settler who descended from Aish Kodesh. I see this settler from time to time, as he apparently has a “Land Development Company.” In 2010, a settler from Aish Kodesh planted a vineyard just where stun grenades had been thrown at our feet. Two months ago, RHR’s legal team got the Legal Advisor for the Occupied Territories to recognize Fawzi’s ownership of the land upon which the vineyard was planted, and an order keeping Israelis out was issued. Fawzi can’t repossess the vineyard yet, but there was no question regarding the rest of his land. That land was also closed to Israelis. The only problem was that Fawzi needed army protection to actually return to his lands. However, the army put him off time after time. Fawzi had invested NIS10,000 in seeds to plant wheat and the investment would have been lost if he didn’t sow the wheat soon. Monday night the army cancelled again, and our lawyers got on the phone. The army agreed that the work would go ahead as planned the next day. Click here for a a fuller description and pictures, but the bottom line is that things didn’t go so well. Security forces battled settlers with tear gas and stun grenades, and arrested some of them. However, they were no match for the determined settlers (mostly women with their babies and small children), who sat down in the fields while others attacked. All the while they vented their anger at the Israeli forces for treating fellow Jews this way. We also discovered that olive trees we had planted the previous week in nearby Kusara had been uprooted the previous evening, and that an elderly family living on the outskirts of Kusara was terrorized. On Tuesday, a man travelling from Jalud to Kusara was pulled out of his car and beaten so badly that he had to be hospitalized. On Wednesday the army was better organized and Fawzi managed to plow and sow, despite the best efforts of the settlers. In the morning, the Palestinians had also discovered several iron bars planted during the night, apparently to puncture tractor tires. All day long the settlers played cat and mouse with the security forces, and at one point tried to set the fields alight with burning tires. As we prepared to leave, it began to sink in that Aish Kodesh’s unchecked reign of terror and relentless expansion had been stopped and reversed. Ultimately, our work will determine to what degree there will be isolated settlements and outposts in the Shilo Valley surrounded by Palestinians exercising their rights to their lands, and to what degree it will be the Palestinians accessing isolated patches of their lands surrounded by the lands taken over by settlers. I said “Thank you” to many of the security forces. Quite a few seemed to share our good feeling. One, however, did not. When I wished him a good day, he said, “I wish you a terrible day.” I had also spoken with him and a friend of his the previous day, as they angrily said I was no rabbi, that I was helping the enemy, that all Arabs are terrorists, that all of the Land of Israel is ours, etc. I tried on both days to acknowledge his anger. Although I am not naïve, I asked whether oppressing people or doing justly was most likely to break the cycle of enmity. I also offered to go over Jewish sources with him regarding the rights of non-Jews in the Land of Israel, and spoke of all of the work RHR does for the human rights of Jewish Israelis. Yousef cut off our conversation, so I will never know whether I might have actually broken through. Sadly, that border police officer will probably continue to think that helping Palestinians is traitorous. Many of you know that whenever we are accused of “Aiding the enemy” or being “Provocateurs,” I answer from last week’s Torah portion, the first chapters of the Book of Exodus. Pharaoh, like many before and after him throughout history, sees Moses and Aaron as provocateurs because they give the “Happy natives” strange ideas about rights. Over the next few weeks, we will also see that things get worse for the Israelites before they get better. Likewise, we all know that the uprootings and beatings of the last few days may be nothing compared to what lies ahead. Settlers will do everything in their power to get those lands back. Some of the good feeling was further dampened when settlers rampaged in the village that night, sending one four year old boy to the hospital with head wounds. You don’t need to understand Arabic to understand the look on his face and the terror in his voice when he was asked “Who did this to you?” and he answers “Il Yahoud”-the Jews. On Shabbat Israelis again attacked Kusara. In retalitation, Palestinians from Kusara attempted to enter the settler vineyard on Fawzi’s land, and began breaking down the fence to the settlement itself. There is no doubt that, after years of intimidation, tree destruction, an arson attack on a Kusara mosque, etc., the entire area is in danger of going up in flames. We call on both Israelis and Palestinians to eschew violence. However, none of the above can take away our satisfaction realizing that some 120 inaccessible dunam have been sowed, and a modicum of justice achieved. The real story from last week isn’t the battles that went on, or the terrible settlers that blocked and beat and sat on the ground with their babies and burned tires. There should be no great pleasure in the fact that settlers were tear gassed, and in some cases beaten or arrested. The real story here is that of partnership between RHR and determined Palestinians, who refused to give up hope that justice could be achieved. When the agadah asks what God has been busy with since the miracle at the sea (The answer is that God has been making matches), we are being taught that, with a bit of faith and determination, small miracles can happen. I am incredibly proud of RHR’s legal team that worked with our Palestinian partners to bring this about. Thank you to the Ta’ayush volunteers who usually do not work in this region. I was initially alone in the field on Tuesday, but you answered the call. I also note that these events took place as the Warschawski family was sitting shiva for Yehudit z”l, a tireless worker for justice and reconciliation, and the daughter of one of RHR’s founders, Rabbi Max Warschawski z”l. I am sure that Yehudit is smiling. This weekend I came across three news items that I want to share. 1 – The first is an Op-Ed column from Haaretz that explores the possibility that the Saudi government is reaching out to Israel. The Arab Spring has created a confluence of common interests between Saudi Arabia and Israel that the author believes has created a tantalizing opportunity for diplomatic progress. This possibility resembles past transformative diplomatic initiatives such as Nixon and Kissinger’s opening to China when a confluence of events made that realignment possible. The question is whether the current Israeli government, given the ideology of its coalition partners, has the strategic vision to capitalize on this opening. 2 – The second item is a feature story about a reporter’s day trip to Hebron during Passover. It offers a glimpse into what has happened to that city as the Jewish settlement there has expanded – and the resulting violence that is perpetrated against the remaining Palestinian residents. My experience is that the attitudes that are portrayed by the reporter are becoming the norm on the West Bank: skyrocketing settler violence – settlers can act with impunity with little risk of consequences – versus an evolving strategy of non-violent resistance on the part of many Palestinians. Last week I met several Palestinians in Gush Etzion outside Jerusalem whose attitudes would better be described as resignation: that resistance is futile and one just has to accept the violence and injustice. The mainstream media has not caught up with this change in the West Bank, where the occasional Palestinian violence still makes headlines but today’s widespread settler violence is mostly ignored. 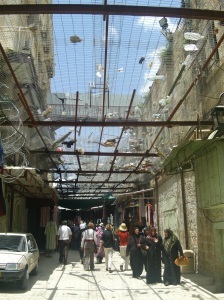 Hebron street with metal grate covering it. Notice the debris thrown down by the settlers above. 3 – This past Saturday, 250 left-wing activists staged a non-violent protest bike ride through the Jordan Valley in the West Bank. A group of Israeli soldiers was waiting for them and their officer apparently led an attack. An article in The Times of Israel features a short video where you will see the IDF officer brutally hitting an activist with his rifle without any provocation. Haaretz has an article that describes the incident in greater detail – the officer alleges he was attacked first and injured – but the embedded video in that article has a technical flaw and is not clear. Unfortunately, this case of an officer allegedly acting with inappropriate violence is not an isolated case as is made evident in this column from this morning’s newspaper. This incident reminds me of a tour of the West Bank I went on several years ago with Breaking the Silence, an organization of former IDF soldiers whose goal is to “expose the Israeli public to the reality of everyday life in the Occupied Territories.” The tour was led by a former soldier who said he was volunteering his time as an act of tshuva (repentance) for the gratuitous violence and abuse that he and his comrades had done to the Palestinians while they served in the area around Hebron. He described how his army unit was emulating the violent behavior towards the local Palestinian residents that the senior officers in the area set as an example. There we were, standing on the edge of the ledge facing a line of armed-to-the-teeth Israeli soldiers 15 feet away from us, as if our scraggily band of middle-aged folks with a sprinkling of 20-somethings posed any threat to their bulging muscles, semi-automatic rifles, and the other weaponry in their hands. They had just roughly pushed us up the rocky incline from the lower field where our group had been busy planting olive tree saplings in honor of Tu B’shvat, the Jewish new year for trees. We had regrouped in a small upper field littered with stones. A few hundred yards behind their line the sun was highlighting the red tile roofs of the settlement of Talmon. We didn’t know if they were preparing another advance on us or perhaps were going to hit us with a volley of tear gas and stun grenades, which we heard they had done to a few brave souls earlier in the day, the residual scent just barely floating on the air. While I was on a tour this past December in the village of Silwan in East Jerusalem with Rabbis for Human Rights we stopped in to visit with Ahmad Qarae’en, a respected neighborhood leader. We met in a small community and youth center located on the main street of Wadi Hilweh, a neighborhood abutting the Old City walls. The center was in an old house fronted by a jerry-built structure that felt like it was part tent and part exposed walls – an addition that was clearly built by local residents. We sat on hard benches and chairs in front of Ahmad as he told us what it was like to live in Silwan. Ahmed was using crutches and by the way he efficiently moved around with them it was obvious he did not have a temporary injury. I assumed he had some kind of a disease from childhood or a long-term genetic condition. That was until he recounted the story of how he had been shot in both legs outside a Jewish settler compound while trying to protect his son from being beaten by a settler. You’ll be able to read his story below. This is the second in a series of posts that will explore the interaction between the Jewish settlers in East Jerusalem and the Palestinian residents whom they want to displace. Most of the material that follows comes from a report produced in 2010 by the Association for Civil Rights in Israel (ACRI). You can access the full 59 page report, titled “Unsafe Space,” at www.acri.org.il/pdf/unsafe-space-en.pdf . Please keep in mind that I have chosen just a sampling of testimonies to illustrate some points below. These are representative of what thousands of Palestinians experience as part of their daily lives. The cost for security to protect the Jewish settlers in the Arab neighborhoods close to the Old City of Jerusalem ballooned in 2011 to 81 million NIS (New Israel Shekels), or over $20 million. The Israeli Ministry of Housing pays for these private security services. A recent article in Haaretz reported that part of this money to protect settlers was diverted from social needs such as public housing in Israel. Keep in mind this is the government paying for security services for private residences, just one of the myriad ways that the government supports the settler NGOs who work to evict Palestinians from their homes. As the ACRI report states, the private security guards “…employ verbal and physical violence, and even make use of loaded weapons. Moreover, according to residents the security guards are “quick on the trigger”, and perceive themselves as holding the ultimate power to serve as arbiters of daily life in the neighborhood. Just one example of this was the killing of an unarmed father of 5 children by a security guard in 2010. See http://settlementwatcheastjerusalem.wordpress.com/2010/09/22/the-guards-just-shoot/. The guard claimed it was self-defense but here is Israeli TV coverage of the same incident which provided video evidence that challenged the security guard’s story. But, as usual, the head of the Jerusalem police accepted the guard’s account. No charges have ever been filed for this killing: http://www.youtube.com/watch?v=hb8pq9qrfRQ. It is the day-in and day-out threat of violence by the settlers that wears down the Palestinian residents. An example is this woman’s account of living next to a settler house. “The settlers’ house doesn’t have a permanent family living in it. There are only men there who are always accompanied by security guards, and they are all armed. In the evenings when they arrive at the apartment, there is a lot of noise, shouting, singing and prayer, and this generally lasts about an hour. I knock on their door so they’ll understand that they are making a lot of noise, then they come out, yelling at me and pushing or hitting me, and it develops into a confrontation…. The situation is even worse on the weekends, on Friday and Saturday, when there is much noise. They always knock on our door to deliberately taunt us, they sing at full volume, they shout. From the moment the Jewish Sabbath begins until it ends, it is impossible neither to sleep nor sit and relax. Last week, Padi, my 12-year old boy, was walking in the corridor [between her house and the settler house] when at the same moment a settler passed by. He pinned my son’s body against the wall slammed his head into the wall — for no good reason, just to intimidate and harass our kids. One day I arrived at home and saw that my granddaughter was crying. I asked her what had happened and she told me that a settler from across the hall had passed her as she was sitting on the stairs and hit her for no reason. Settlers act with impunity against Palestinian residents with no fear of police action. The ACRI report cited one woman who filed 20 complaints against violent settlers and not once was any action taken by the police. Other Palestinians report that the police refuse to accept their complaint forms alleging settler attacks or, even worse, when they try to file complaints they are themselves arrested as the instigators of the violence. A typical example follows. During a neighborhood party of Palestinian residents, a local woman reported “10-12 settlers came out of the al-Kord family house in the direction of the second house under their control. One of the settlers was holding a video camera and he filmed me and all the girls [with me] in a very provocative manner: he pointed his camera at me and approached to within a foot. I shouted at him and asked him why he was filming me? He gave no reply and continued to shoot until finally I moved his camera aside. In response, he punched me in the face. As a natural reaction I defended myself, pushing him backwards, but he wouldn’t stop hitting me all over my body.” Police, who were nearby and witnessed the event, did nothing to stop the beating. This woman was so badly beaten she was taken to the hospital by an ambulance. When she went to the police station afterwards to file a complaint, she was arrested for starting the fight. Ultimately she was given a three-month restraining order from her neighborhood and a 700 shekel fine. Unfortunately, Palestinians often resort to stone throwing out of a sense of helplessness and rage. They feel totally trapped in a system of violence and oppression that is rigged against them. At least part of the cause for this is that other, non-violent means of protests are met with disproportionate violence from the police or army: tear gas, stun grenades, and bullets. Community organizers who espouse non-violent protest are persecuted and banned, leaving no other outlet for the anger. In 2011 the police made a concerted effort to destroy the community organizations that oppose the settler activities in East Jerusalem by targeting the leaders. See http://settlementwatcheastjerusalem.wordpress.com/2011/01/10/police-silwan/. The ACRI report sums up the settler violence and repressive government policies by pointing out that eventually all of society suffers. “Selective and discriminatory enforcement of the law by the police, which turns the Palestinian residents into readily-available victims and permanent suspects; the arrest of minors in the middle of the night; the free reign granted to security guards, who use force broadly without even minimal supervision; the unequivocal and unacceptable preferential treatment shown towards Jewish needs in the neighborhood when it comes to planning, building and developing, to the point of taking control of precious land resources; the sweeping violations of freedom of movement, and more – in all these, the authorities systematically favor the needs and interests of the Jewish settlers over the basic needs of the Palestinian residents, while making daily life in these neighborhoods intolerable. I began this post by describing a tour sponsored by Rabbis for Human Rights where we met with Ahmad Qarae’en, the community leader who was shot and crippled. As a fitting end for this post I have included below his account because it ties together so many of the threads that were discussed above. “My injury occurred on Friday, September 11, 2009. At 5:45 p.m. I returned from prayers [on the Harm al-Sharif/Temple Mount] and I was very tired from the fast, as it was the middle of the month of Ramadan. I was lying on the sofa, when suddenly I heard shouts. I put on shoes and went down the street to see what had happened. A neighbor’s son told me that a settler had hit another neighbor’s children. The boy pointed him out to me, and said it was over now and that everything was OK. I turned to go home, and suddenly I heard the screams of my little boy, and when I turned back I saw my oldest son coming to protect him from the settler. It was then that the settler pointed his rifle at the chest of my eldest son. I came straight at the settler and shouted “Why are you beating up kids?” He raised his M-16 and said: “I’ll shoot you, too,” and he started walking backwards. I kept asking him: “Why are you hitting them?” When he reached the sidewalk, he tripped and fell to the ground. His friend who was with him told him: “Get up and shoot him,” and he got up and shot my right leg in the thigh. I fell and started shouting ‘Ambulance, ambulance!’ Suddenly I heard another shot and then I saw a little 13-year old boy named Amir Farouk screaming ‘My leg, my leg!’ The settler had shot him too. He then returned to me as I was lying in the street and my oldest son Wadi’e was hovering over me, crying. He shot me again, this time in my left knee. One of the guys called an ambulance, but since I was bleeding a lot and the ambulance hadn’t arrived, the guys loaded me into one of their cars to drive me to the hospital. We had not yet left the neighborhood, when a border policeman stopped us near the Muslim cemetery. They removed the driver and handcuffed him and told him he was under arrest. All attempts to explain to him what had happened were to no avail. After a few long minutes, a border policeman opened the door of the vehicle and when he saw me bleeding, he did not react at all. He shut the door and stood next to us while talking with his superiors. After three minutes, a regular police unit arrived and released us. We had barely traveled another 10 meters when the border police stopped us again for another 3-4 minutes. This time, drivers who witnessed our first arrest and were stuck in traffic began shouting at the police that we were wounded, until they were convinced to let us pass. They took me to the hospital on Mount Scopus, where I received about 7 units of blood. Before I even entered the emergency room, a police investigator arrived and asked the medical staff to stop my treatment so that he could question me. He collected my testimony, while the medical staff treated the second child who was wounded along with me. The hospital closed the entrance to the emergency room and didn’t allow anyone to enter and visit me other than my wife. Police were stationed at the entrance to the hospital. After two days I underwent surgery, and as I came out of the operating room, still under the influence of anesthesia, two police officers arrived and demanded to question me. My two brothers who were in the room with me tried to explain that I had just come out of surgery and was still in intensive care, but they threatened to arrest my brothers if they didn’t leave the room. The officers accused me that I jumped the soldier and tried to wrestle away his weapon. Until that point, I didn’t know he was a soldier, I thought he was a settler, because he was in civilian clothes and looked just like the rest of the settlers in our neighborhood, and those who come to visit them. The investigators took DNA evidence from me and stated that they also wanted to question my two children. The summons for the questioning of my two children arrived at my hospital ward after about a week. On the fourth day after the shooting, they questioned my youngest boy for about 3 hours. His mother, who was present at the questioning, told me that the questions seemed designed to make the child feel that it was his fault for what happened to his father, that if he hadn’t gone out to play in the street, then his father wouldn’t have fought with the settler and wouldn’t have been shot. They asked him repeatedly why I went out into the street, what happened to your father, and so on. During the investigation of my oldest son, they shouted at him in Hebrew all the time and he did not understand a thing. Two investigators questioned him at the same time, while another typed into the computer. I want to thank you for following this blog. On average there are well over 100 people who are reading the posts. This is especially gratifying since I began it only one month ago. As you may have surmised, I am writing the blog mainly because I am worried about the future of Israel, both for its survival and what kind of country it is becoming. Right now many Israelis share this concern and feel the land they love is being distorted into something unrecognizable. Last fall a friend who made aliyah 40 years ago posted a column on her blog that was addressed to Sara, a young Israeli who was brutally attacked and beaten by settlers including off-duty police during a violent incident on the West Bank. Our friend used strong language but this only reflected her grave concerns. Like our friend, I want Israel to remain a country with all the safeguards of a true democracy and one that lives up to the ethical ideals embodied in the Jewish tradition. Sadly these yearnings are endangered today. Nonetheless I remain optimistic and I believe that America has a critical role to play. But American politicians will not exert the influence they have to convince Israel to change its policies until the American Jewish community alters its perspective. My experience is that the preponderance of American Jews view Israel through a nostalgic lens but have little knowledge of the modern state. I am convinced most Jews would be upset to learn what is actually going on here and would demand a change from their community leaders if they did know. Which brings me to this blog. The reason I am writing it is to do just that – to inform as many people as possible about what is happening in Israel in the hopes that my efforts, in addition to others who are doing similar work, will begin to change perceptions. So, as you read future posts, I hope you will forward on the columns that you feel would be of particular interest to your friends, relatives and other contacts. You can do this via email to individuals or community lists, Facebook, Twitter, or other social media. It’s also not too late to do it with prior posts as well. I realize we all hesitate to do this – no one wants to impose on others and be a bother – and I felt the same when I first launched this blog last month with a series of emails to our friends and family. But if we don’t actively spread the word we won’t have an Israel that embodies the universal ideals on which it was founded. For my part, I promise to continue to do research, to dig for more information, and to go out and report on things I see with my own eyes. I will try to keep my commentary and opinions from seeping in too much – although sometimes that is hard to do when I encounter something particularly disturbing – but I will try to let the facts speak for themselves while attempting to provide some measure of balance. I hope this request is not too chutzpadik and I apologize if I have overstepped the etiquette of blogging. PS: As I was about to press “publish” to send this note to you I received an email alert from Rabbi’s for Human Rights that three Bedouin homes in the West Bank were demolished between 11:00 p.m. and 4:30 a.m. last night, displacing 20 family members including young children into the cold desert night environment. The bulldozers were accompanied by a contingent of heavily armed soldiers. Their crime was lack of a building permit – which in the Catch-22 of the occupation is nearly impossible to obtain. You can read details of this incident at The Israeli Committee Against House Demolitions at http://www.icahd.org/?p=8107 . This is just one example of the many events that seldom get reported. I hope to write about these situations in a more systematic way so that readers will understand how widespread these practices are and the strategic objectives behind them. Enter your email address in the box below to receive notices of new posts -- then click on the black button just below that. You will receive an email asking you to confirm the subscription. You must click on the "Confirm Subscription" button in that message to activate it.